Sergei Rachmaninoff was a titan of early 20th century piano music, creating finger-breakingly difficult pieces and heart-meltingly dark, romantic music. He was equally famous as a pianist and as a composer. I find Rachmaninoff's music sultry and passionate; most of it is very mysterious and gloomy - even old Rach himself said that he had trouble writing happy-sounding pieces! His piano pieces are legendary. Rachmaninov had bizarrely large hands, which meant he could cover about 1.5 times the keyboard space a normal person could. He also had an appetite for speed and a disregard for the safety of others. This scary combination means that a fair amount of his solo piano music requires superhuman skill to perform. 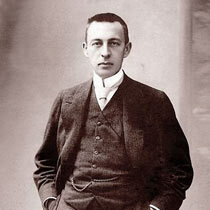 Sergei Rachmaninoff was born in 1873 in Novgorod, to an aristocratic family. His father drank and gambled away the family wealth, so the rest of the Rachmaninov clan had to run away when Sergei was young. He was an enormously talented pianist as a child, and studied music and piano in St Petersburg and Moscow. But because everything came easily to him he got lazy and didn't bother studying. He ended up failing most of his classes. While he was a student he wrote the opera Aleka and the infamous Prelude in C Sharp minor, which he would eventually get seriously annoyed by even though it was hugely popular. When Sergei Rachmaninoff was 24, his First Symphony was premiered. But it was a disaster, and completely unsuccessful. It may have been because Aleaxander Glazunov (the composer), was conducting it. Anyway, Rachmaninov fell into a severe depression for three years. He didn't compose anything during this time. But after a course of pioneering psychological therapy, he recovered and went on to compose even greater works. He turned out the Piano Concerto no 2, which had a successful premiere. It boosted his Reputation as a composer. He toured the USA in 1909 with his devilish third piano concerto, which made him super-popular over there. After the catastrophic Russian Revolution in 1917, Rachmaninov fled to America with his family, and began an extremely lucrative career giving concerts and making recordings. But he was deeply homesick for his native land, which had been lost forever. So he recreated Russia in his house, employing Russian servants and celebrating Russian festivals and traditions. His fame grew and grew in America, although his composing slowed hugely. It was as if he had lost his inspiration. Instead he spent most of his time conducting and performing. He died of skin cancer in 1943, in Beverley Hills, California. Rachmaninov's music has a unique flavor and sound. He started out being influenced by Tchaikovsky's music, but soon created his own unique style full of lavish harmonies and emotional melodies. He was a master of complexity, and gave his music an almost modern feel. Rachmaninov was also a skilled orchestrator, creating subtle textures and controlling instrumental combinations to stir the soul. He liked to use widely-spaced chords to create bell-like sounds, both in his piano and orchestral music. As a pianist he was famous for having a clean and almost impossibly precise sound, separating all the different textures in a piece so you could hear them individually. At the same time he breathed a lyrical spirit into his melodies so they still affected listeners. 2 sets of Etudes Tableaux. As you'd expect from such a supremely skilled pianist, his etudes (studies) are a glimpse at the extreme realms of piano potential. These are stamped with his trademark sound, and along with his concertos are primes examples of Rachmaninov's style of piano music. Rhapsody on a Theme of Paganini. This piece is from relatively late in Rach's life. It's a set of variations for piano and orchestra on a theme by Nicolo Paganini, the violin virtuoso. The 18th Rhapsody is especially popular, with a gloriously sweeping melody. Piano Concerto No. 3. Worshipped by piano virtuosos, this concerto is probably one of the most difficult and extreme in existence. The Bells. This orchestral choral piece, using words from a poem by the macabre poet Edgar Allan Poe, was one of Rach's favorite of his own pieces. The piece is grand, beautiful, and mournful all in one. Symphonic Dances. Rachmaninoff's last piece, it shows us his highly advanced later style of composing. Vespers, a collection of deeply moving choral works based on Russian Orthodox church traditions. The textures and chords Rachmaninoff creates using just human voices is unbelievable, and the pieces are powerfully moving. Lucky for us, Sergei Rachmaninoff was alive during the start of the era of recordings. There's a fairly large collection of his performances, including many of his own compositions - we can hear how he intended them to sound! Here's an interesting Rachmaninoff timeline and calendar.